Little Treasure was created in 2017 with the goal of offering moms elevated quality newborn infant essentials at value prices. Little Treasure presents parents with modern designs, superior, durable fabrics and focusing on maximum comfort for baby without compromising on quality to meet the rigorous demands of retail price points. Little Treasure will offer high-end designs in baby apparel and accessories without the designer price. Our line includes apparel, bibs, hooded towels and washcloths with more to come. 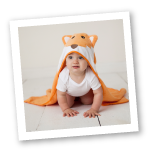 We make baby essentials that truly seek to maximize your little one’s comfort and cuteness. Your little one will be happiest when they feel comfortable and cozy and a happy baby means a happy home! Little Treasure products can be found online on all major retail websites and in retail stores across the United States.